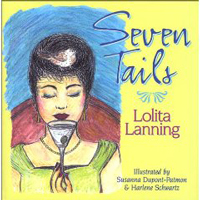 Lanning is the author of Seven Tails (2002), a collection of humorous and heartwarming animal 'tails': a martini-sipping bird, a great horned owl who hunts tennis balls, and a beagle who catches goldfish. The stories are all true and Lanning's love for all creatures great and small comes through loud and clear. The book is beautifully illustrated in full color. Lanning and her three dogs share homes in Santa Barbara and on Bainbridge Island.